I’m not a big texter. Or so I thought… Sure, I normally send out a few texts a day to my wife or friends to handle simple or immediate communications. I’m not constantly carrying on conversations, using this convenient technology in place of a phone call. For the past seven years, I’ve lived comfortably using a $5/month texting plan from AT&T that gave me 200 free texts each month. But I’m here to report that 200 texts a month are not enough to live on. Over the past couple of months, I’ve been regularly crossing that line and getting dinged. And I’ve got to tell you; those ten-cent nicks are really painful. Clearly I’m the last one at the party to realize this, as I’ve found out that my $5 plan isn’t even offered to new subscribers anymore. But then a funny behavior developed. That line disappeared, and I started receiving work-related texts on my iPhone. …Or other moments requiring an immediate response, which texting is obviously better suited for. I’m talking about those moments where an email would do just fine. But my colleagues choose to text me anyway. But if you’re not at your desk chained to your computer, even I’ve got to admit that texting is easier than sending out a work email from your smartphone. So is this simply all about convenience? When someone sends you a text, you look at it pretty quick, right? That’s because we all receive so much email… both at home and at work. Some of it you need to read… a lot of it you don’t. It can be overwhelming just trying to keep up. 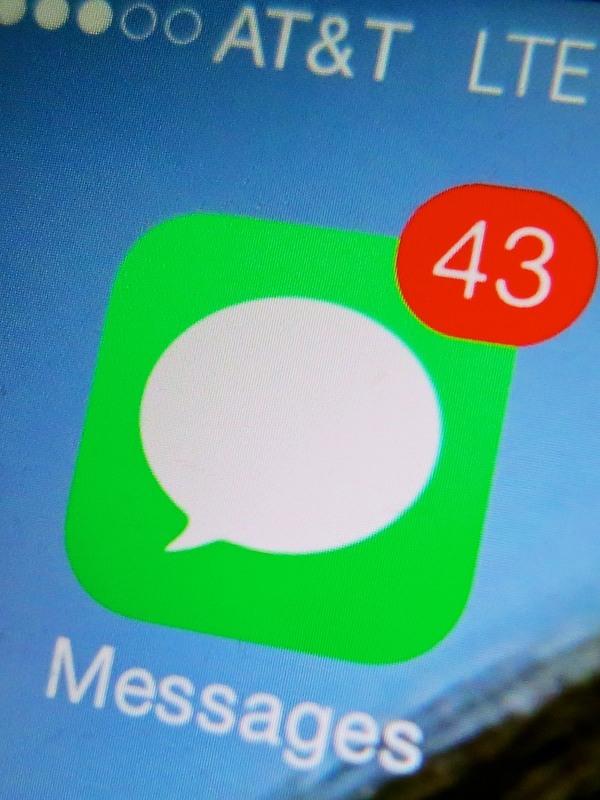 Sure you can check your smartphone every fifteen minutes to review the 20 emails you’ve just received… but it could take until tomorrow to respond to every one of them. It doesn’t take rocket science to explain why the art of texting at work has become a necessary practice just to get through your day. Has some kind of social rule been rewritten with the growth of work texting? Well, I may be the last person on earth to even consider this a problem. So I called AT&T and upgraded my texting plan to ‘unlimited’ for an extra $15/month. If you do the math, that means I’ve got to burn through at least 150 more texts to break even on the new plan. I’m not sure I’ll need all that for work. But I know one evil force that will firmly push me into this ‘new’ frontier is the variable of group texting…. That can really goose the number of texts you get! I imagine one day in the not too distant future, people will grow weary of slogging through too many texts. And then all those texts will sit unread like their email cousins. You’ll have to pick up the phone!